The Russian River is a very popular 13-mile-long river on the Kenai Peninsula that flows northward from Upper Russian Lake in the Kenai Mountains through Lower Russian Lake, draining into the Kenai River. The waters are fairly shallow with a hard-packed gravel bottom, which makes it very easy to navigate. The Russian River Ferry at the confluence of the rivers carries foot-passengers to the busiest combat-fishing spot in Alaska. Be prepared for crowds when the salmon run hot. It’s not uncommon then to fish within 4 feet of another fisherman – on both sides of you! The Russian River Ferry is a privately operated ferry at the confluence of the rivers carrying foot-passengers. There is an $11 fee (Cash, checks, or money order ONLY). It’s about 5 miles back to Cooper Landing to get cash from an ATM if you don’t have any $$ on you. Not to mention that you’ll lose your parking spot! 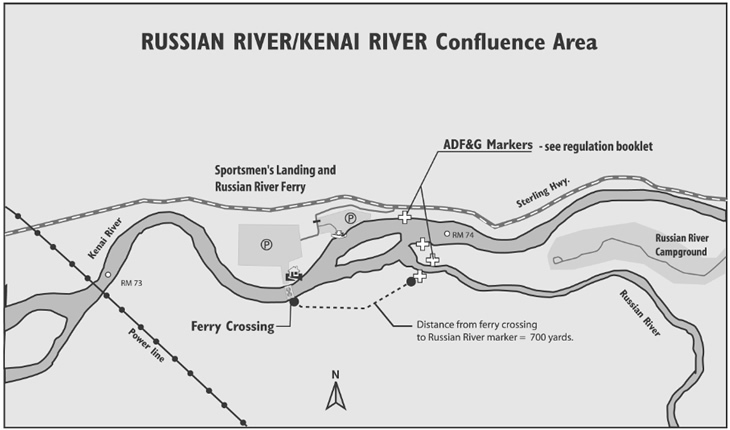 The parking lot is known as the Kenai/Russian River Access and Sportsman’s Access Site. The Russian River Ferry starts running at 6am and stops at 11pm. If you are stranded on the other side after 11 you can walk to the Russian River Campgrounds by crossing the river. – Waders – Don’t even think of trying to fish there without them. – Russian River flies – 15 per day minimum per person. – Split shots for weight (PSS-3 by Water Gremlin) Use 2 or 3 depending on water speed. Weather you fish with a fly rod or not, the Russian River is a single hook fly area only. No lures or bait of any kind. 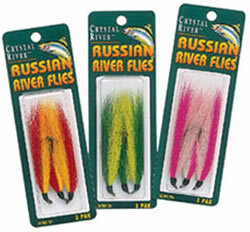 All fishing tackle shops and Walmart have flies called Russian River flies. Yes Russian River flies! Many sections of the Russian River/Upper Kenai are considered fly fishing only. This does not refer to the fishing rod or the fishing style, but to the terminal tackle. Two distinct sockeye salmon runs return to the Russian River. The early run usually arrives by June 15th; with an average return of about 70,000 fish, half of which is usually caught by sports anglers. The second, or late-run fish usually arrive in mid-July and averages about 100,000 fish. These fish, usually a year younger than their first-run cousins, are usually a little smaller, about 5-6 pounds on average. Blue-tinged silver in color, sockeye salmon live four to five years. They weigh up to 7 pounds, and are the slimmest and most streamlined of the five species of Alaskan salmon. Known to fishermen in Alaska as reds, the sockeye is historically our most valuable fish because of its high oil content and ability to hold its bright red flesh color. Silver salmon have silver sides and dark-blue backs and put up a great fight with lots of jumping. Alaskans look forward to “Silver Season” in August. Silver’s usually weigh 8 to 12 pounds and are 24 to 30 inches long, but individuals weighing 36 pounds have been landed. The best part about fishing for silvers at the confluence is that the place is usually empty and crawling with fat fish. You must release all king salmon on and near the Russian River confluence. You are also not allowed to land them. You must release them in the water – no lifting them up for pictures. Fish cops are everywhere along the river, be smart about it and you’ll be fine. Here’s the webcam link to the parking lot near the ferry. The 83 camp site Russian River Campground is the largest and one of the most popular campgrounds in the Chugach National Forest. The campground along the Russian River is one of the most organized and well laid out units in Alaska. All 83 Russian River sites are RV suitable and paved. 2 Day-Use Parking Areas are provided. User Fee required. Day Use Parking is limited to 12 hours per vehicle. There are foot trails for hikers along the Russian River to the viewing platform at the Russian River Falls. The campground is located along the Russian River itself and affords the visitor the opportunity to fish the clear waters of the river and observe the fish you are trying for. The river is of modest size and during most years is easily wadable using hip boots or waders. Fish cleaning tables are provided at key locations along the river and access from the campground to the river uses several stairway structures along the embankment overlooking the river valley. There is no direct road access to the river. It can be accessed either by hiking in or by the privately operated ferry that crosses the Kenai and takes fishermen to the mouth of the Russian. The Russian River Fishing area is located 110 miles south of Anchorage, about a 2 hour’s drive through some of Alaska’s most spectacular roadside scenery. Located on the Kenai Peninsula, accessible by road from the Russian River campground. Closed to all fishing April 15 – May 30. Check regulations for limits and other restrictions that apply to the season you will be fishing. Cooper Landing is a little town just before you get to the Russian River from Anchorage. There you can get fuel, fishing tackle, and there are many motels and a few convenience stores. For the rafters in the group – Cooper Landing is best known as the starting point for raft trips down the Kenai River. A number of companies run raft trips ranging from gentle floats to Class III whitewater in the Kenai Canyon. The Russian River is a bear magnet. Use common sense and don’t be like this guy. If you fish at night and wander through the forest with fish on a stringer, you are begging to be mauled. Similar to the rest of the Kenai Peninsula, brown and black bears inhabit this area, searching for salmon for themselves and/or their young. Unfortunately, the food sources they often find are coolers full of lunches, stringers of fish, and other sources of human generated food. You are responsible for your own safety in bear country. In any outdoor activity – fishing, wildlife viewing, hiking, hunting, picnicking, berry picking, even going to work – you may encounter bears. Be aware of your surroundings and conditions, especially in times of low light and areas of low visibility. Look up and around every few minutes. Check the immediate area for fresh bear signs. Consider moving to a different spot if such signs are encountered. Don’t make it easy for bears to find food – garbage, birdseed, picnics, fish, or game, for example. When you catch a fish you intend to harvest, immediately kill your fish, then bleed it into the water. Bleeding into the water quickly clears the blood from the fish, thus improving quality. It also reduces the chance that blood, which may attract the attention of bears, will get onto clothing or the stream bank. Late May through August they are. Remind the ferry operators to send an Email to Jim Johnson that they received a lending library and books from me. when would be the best estimate time in June to fish for Red’s in their first run at the Sportsmen’s landing? Thank you! Mid-June fish start showing in good numbers. BUT, Mother Nature makes that call and sometimes she delays it a bit. The article says second run is in July. 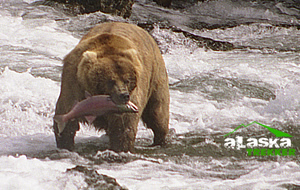 Can we expect to see salmons and bears in mid-August? Thanks. Second big run is in July. 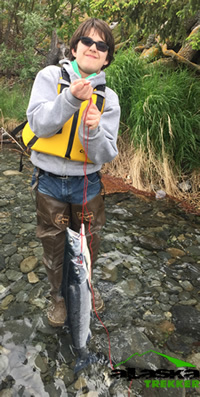 There are salmon from mid-May until late August all over Alaska. Sure there are salmon and bears in August. August has the best fighting salmon, the coho’s. I’ll be visiting on June 2nd, and looking to do plenty of fishing. I read that fishing on the Russian river/kenai confluence this early in June is a waste of time? Is it not worth stopping? You are not allowed to fish below Skilac lake before July 1st. Planning on a trip to the Kenai Peninsular August 11-18. Planning to stay a few days at the Russian River Campground. Is this a good time for silver salmon and how busy is it? Hardly anyone is there. Fishing is hit and miss depending upon the commercial fishing at the mouth of the Kenai. Trying to find out how early the ferry starts up? Making a trip down early June, not planning to fish, just check it out. I can’t find online the dates the ferry runs. Good Question. I’m not sure either but I’ll make sure to ask the first time I go down this year. I know that it is open in early June though.